Working as a part of the operation theatre suite, the Central Sterile Supply Department (CSSD) performs a crucial function to process, issue and control the complete range of sterile stores supply to all departments in the hospital. • Provide inventoried supplies and equipment such as sterile linen packs, basins, and instruments to the relevant patient care areas, ICUs and operation theatres. • Maintain an accurate record of the effectiveness of the cleaning, disinfecting and sterilizing processes. • Monitor and enforce controls to maintain sterile processing and distribution standards to prevent cross infection according to the hospital infection control policies. 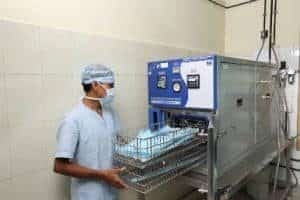 The CSSD unit is equipped with state-of-the-art autoclaves, supplies and other monitoring features to ensure that the department operates according to the high standards set by the hospital to ensure patient safety at all stages.